The maritime port of Guayaquil stands to benefit from the Ecuadorian Government’s milestone infrastructure project that will see the construction of the country’s longest bridge. Spanning 44.20 kilometers in total, the southern viaduct project will directly link the port and the South side of Guayaquil to the province of El Oro, and the south of the country via a new road. 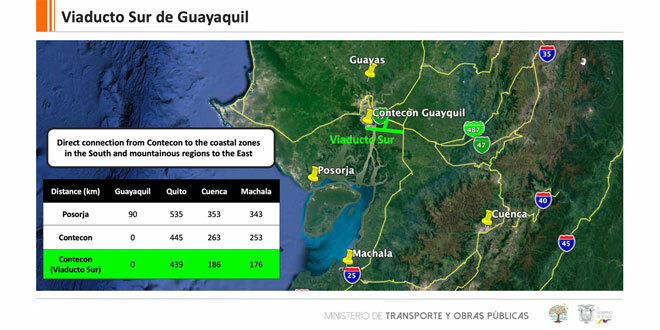 The project involves the construction of two important bridges: an 855-meter bridge over estero Cobina, which is near the port; and a 3.44-kilometer bridge over the Guayas River, which will be the longest bridge in Ecuador serving as entry point to Guayaquil. 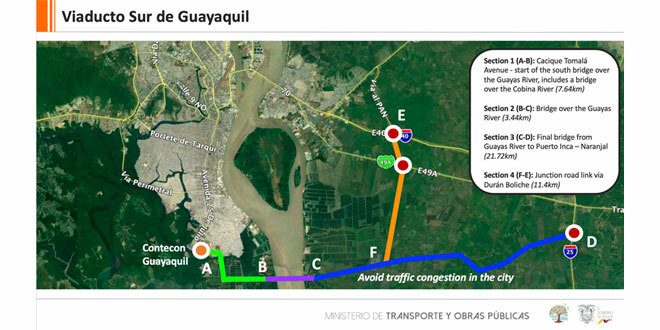 “This infrastructure project will vastly improve the logistical competitiveness of the Port of Guayaquil by significantly reducing the travel distance and time of goods entering and leaving the port. We support the national government in this monumental undertaking, which aims to facilitate more efficient trade movement and consequently boost foreign trade for the benefit of the economy,” said José Antonio Contreras, Contecon Guayaquil Chief Executive Officer. More than 12 million tons of products pass through the Port of Guayaquil each year. The viaduct will serve as a direct corridor from the seaport to the Naranjal Canton via the Puerto Inca-Naranjal road. It will cut travel distance to the southern banana estates, such as El Oro, by as much as 60 to 100 kilometers, translating to around USD90 million reduction in transport costs. In addition to this major landside infrastructure development, Contecon continues to advance its marine capabilities as well. In July, Contecon received the Government’s approval to handle larger vessels up to 305 meters LOA or 6,500 TEU, essentially becoming the only terminal in Guayaquil capable of berthing two post-Panamax vessels simultaneously. “This project, along with the developments in the port, shows just how much the Government and the private sector can achieve by working in sync to the benefit of the public. Our commitment to Guayaquil and its people remains strong. We are excited and very much looking forward to the completion of these key projects and the benefits they will bring,” said Mr. Contreras. Aside from benefitting the economy, the viaduct is also expected to minimize traffic congestion in the city by at least 45 percent to benefit the public. The project, which will be a concession contract, is expected to be completed in 2021. The Ecuadorian Government launched the public tender for the construction last October 5, with the winning bidder to be announced early next year.